(Natural News) Imagine an incredibly dense type of wood that has more than 10 times the strength and durability of natural lumber, making it more than a match for metal alloys. Well, you can stop imagining, because a Maryland-based research team devised a process to turn that hypothetical wood into reality. 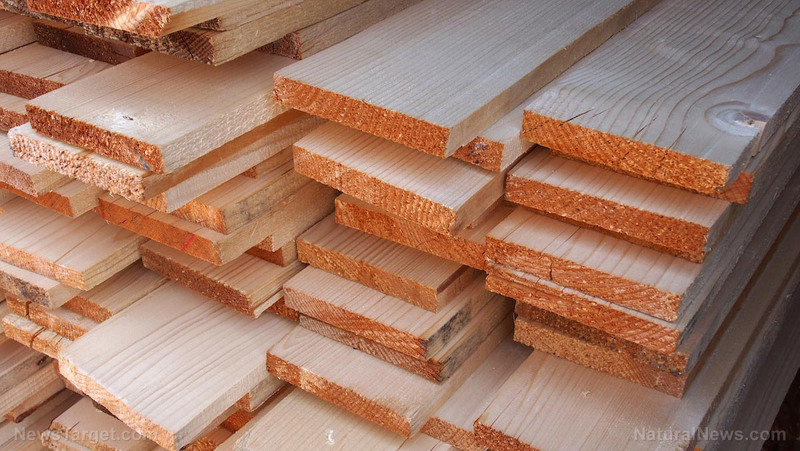 Humans have used wood for thousands of years to build furniture, structures, and vehicles. Increasingly large and demanding projects eventually exceeded the mechanical strength of wood, so they looked elsewhere for stronger structural materials. Most construction jobs and manufacturing processes now use synthetic materials like steel, titanium, and their associated alloys. However, metals are produced by fuel-hungry and highly-polluting industrial processes. They also weigh a lot, which makes them difficult to move. Polymer composites and bio-mimetic composites offer similar performance to metals, but they are also extremely expensive. Therefore, researchers at the University of Maryland, College Park (UMD) reconsidered wood as a candidate for construction materials. Specifically, they looked at pre-treatment processes that could strengthen natural wood past its normal limits by increasing its density. The main weakness to current methods of pre-treating wood is that wood cannot be forced to get denser past a certain point. UMD researchers devised a new two-step pre-treatment process for wood that would overcome these two limitations. They boiled natural wood in an aqueous mixture of sodium hydroxide (NaOH) and sodium sulphite (Na2SO3), which removed some of the lignin and hemicellulose that comprised the cellular structure of wood. The treated wood is then subjected to hot-pressing. The application of heat and pressure breaks down cell walls and forces cellulose nanofibers to align themselves much more closely than normal, leading to full densification. The resulting wood was light, strong, and inexpensive. It weighed one-sixth as much as steel while demonstrating the same mechanical strength, and it could be shaped at the start of the process. “This new way to treat wood makes it 12 times stronger than natural wood and 10 times tougher,” said Liangbing Hu, an associate professor of materials science and engineering who leads the UMD research team. According to him, the processed wood can match the structural performance of steel or even titanium alloys. Hu also claimed it’s cheaper than carbon fiber while also being just as sturdy and promising. “It is both strong and tough, which is a combination not usually found in nature,” confirmed Teng Li, an associate professor of mechanical engineering and Hu’s co-leader. Li’s team analyzed the mechanical properties of the incredibly dense wood. He reported that the pre-treated wood can withstand ten times the amount of pressure that would fracture natural wood. One of the tests of the UMD research team measured ballistic resistance. The researchers fired projectiles at samples of both the new wood and natural wood. While the makeshift bullets easily penetrated the normal wood, they were stopped by the fully-treated wood. According to the researchers, their two-step process worked on many kinds of wood from different tree species. “Soft woods like pine or balsa, which grow fast and are more environmentally friendly, could replace slower-growing but denser woods like teak in furniture or buildings,” Hu recommended. Other wood-derived products devised by his research team include clear paper to replace plastic, photonic paper, batteries, a supercapacitator, transparent wood, and solar water desalination.